The slide drying oven TDO Sahara with electronic temperature control, timer and digital display provides unique features, such as an hot air ventilation system using a fan. Although designed primarily for histology, because of its flexibility this quick dryer is applicable also in other laboratories. 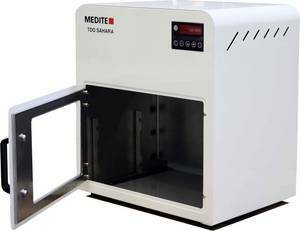 The particular advantage of the Medite® TDO Sahara is its extremely short warming up and drying time. Using the thermostat controlled fan, heat is regularly distributed inside the chamber and the set temperature is achieved in just about 1 minute. The total drying process is completed in only 5 to 10 minutes, depending on the desired temperature. The drying oven is delivered ready to use with two lattice inserts.